We co-organized the Responsible Data Forum with the engine room on Sept 30 - Oct 1 2014 in Budapest. The Responsible Resource Sprint built upon the work that started in Oakland in March 2014. Thank you to everyone who joined us for the CA Tech Fest in Richmond, California on September 25-26. The CA Tech Fest was a two-day gathering of over 100 folks from California and abroad who are passionate about leveraging technology and creative media for social justice. 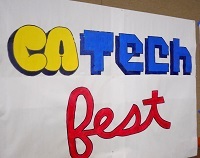 The CA Tech Fest Community Call took place on Tuesday, September 23, 2014 at 11:00 am PT. We hosted an informal community call to help participants get a better picture of what would be going down in Richmond on September 25th & 26th. Thank you to all who attended this online webinar to find out how you can get started sending effective email newsletters with the right tools. Thank you to all who attended this webinar to dive into organizing and engaging people online. During this webinar we shared tactics and techniques to engage active users of online spaces with participants' advocacy work. Mobilizing people is a key component of effective campaigns. Just like offline organizing, this comes from first identifying the people you need to reach and then moving them to action. Do you run into annoying formatting problems when trying to put together your email newsletter in a blasting tool? Are you confused about why the white space is showing up next to your images, making things look off kilter, and want to get rid of it? When you see the HTML behind your email newsletter, does it look likegibberish? Do you find that these same things happen when you try putting content in your website CMS? We excitedly returned to Los Angeles for our eAdvocacy training. Thank you to all who attended on May 15th. Check out the event recap and training resources, and contact us if you have any questions. We’re excited for CiviCon 2014 on April 24 and 25 - the world's biggest CiviCRM meetup! The annual conference for CiviCRM developers, implementers, administrators, and users – happening in San Francisco Bay Area. Aspiration will be there facilitating a session and being a big CiviFan throughout. Register Here. See the recap of this training and get the materials here.